I occasionally read the emails from TheStreet.com. One of Jim Cramer's themes recently is that tech is in the "house of pain" and should be sold into rallies or avoided altogether. Having a particular interest in tech, I was wondering if I could prove or disprove his thesis. As it happens, the Durable Goods report for February was just released and we can see how tech in aggregate is performing. It appears that shipments in the tech sector peaked back in September 2010. Furthermore, the six month moving average has turned down. If you're keeping score, you might say Cramer 1, tech 0. This is the category that gets the most attention as it provides a glimpse of what might unfold in the future. Here the situation is slightly better. We have the same peak in September of 2010 and, though the six month moving average is turning down slightly the most recent data point shows that there was a bit of an improvement in February. This suggests that shipments may at least hold steady in the short term. Let's call this one a draw. You can see that a significant pullback has been in progress. 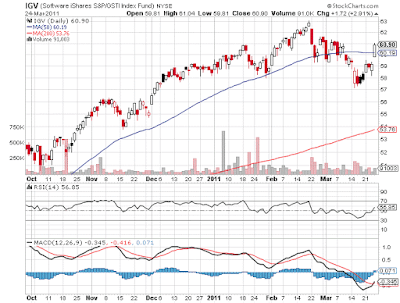 Despite the rebound underway, this ETF remains below its 50-day moving average. 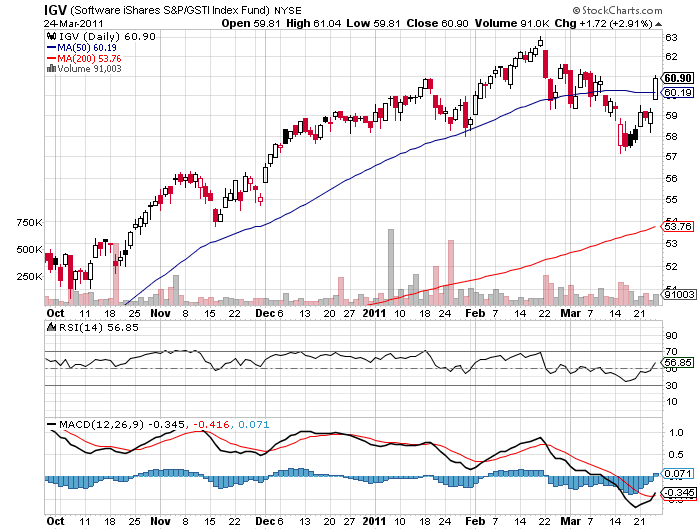 Here we see the ETF, which did not suffer as sever a pullback, has now crossed above the 50-DMA and MACD is just turning bullish. With the issues affecting the hardware sector due to the problems with factories in Japan and the slowing of new orders, it appears that Cramer may be right. 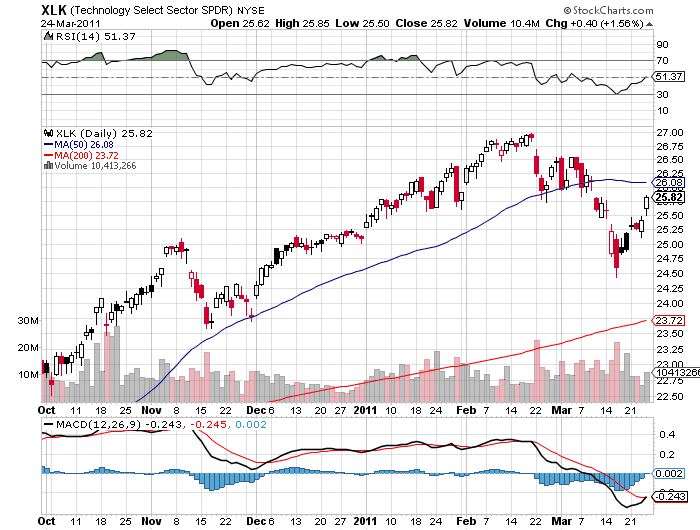 For those interested in the tech sector, software seems to be the way to go. We just had great earnings from Red Hat, for example and pretty good earnings from Oracle while on the hardware side Cree and Research in Motion both suffered after offering disappointing guidance. Cramer's caution on tech, especially the hardware sector, seems to be warranted. Disclosure: I have no positions in any stocks or ETFS mentioned, and no plans to initiate any positions within the next 72 hours.